Why the shape of a Yield Curve is a solid predictor of a recession (or a recovery)? I actually never heard a coherent explanation of why a flat or inverted Yield Curves signal recession so well. Typically 99% of answers to that question would center around what a Central Bank of a country would do and what investors think about its possible moves. It has some validity but the argument is incomplete. In a steady or recovering economy, most businesses would be asking for money (credit) to finance longer-term investments (plants, shops, warehouses, etc.) which typically have 3-5-7 years longevity of completion. Therefore at those steady stages, demand for long-term capital exceeds demand for short-term capital. In those situations, Interest rates for a few years out are higher than interest rates at the short-term. A Yield Curve at that moment would remain steep or steeper (if an economy is accelerating). When an economy does slow down, business halt launching new long-term investments and many companies start experiencing a cash crunch. During a cash crunch, their working capital would be drying up (clients are not paying past due receivables, and inventories are sitting on the shelves or in warehouses). See Figure 1. Those cash-starved companies rush to banks requesting: Please give me a 6-month loan, any rate, now please, please! The exact interplay is less relevant – there is no exact pattern. 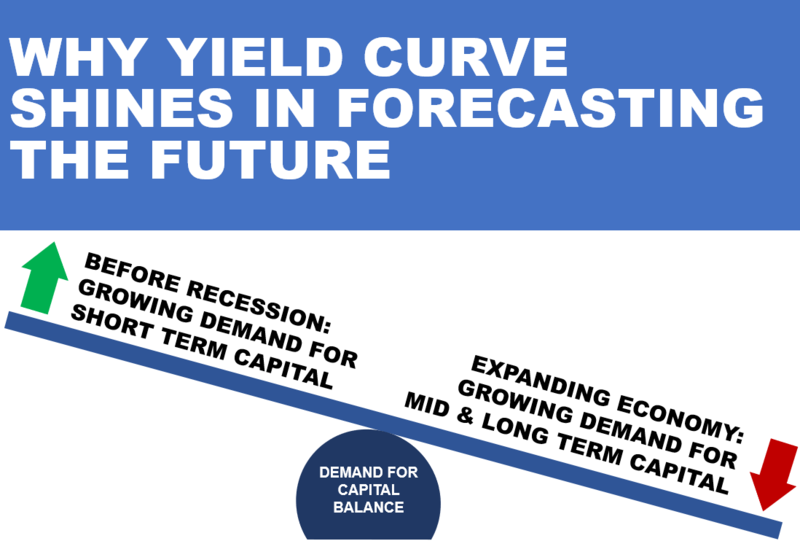 The Yield could either invert or just flatten out but the overall message is undeniable: businesses need more short-term money than longer-term funding is the profound reason for changing the slope of a Yield Curve. That happens way before economists start seeing signs of weakness. It is all interconnected – all bank loans, credit, and corporate bonds are all priced, hedged and swapped with government bonds and, therefore, the interconnection is unbreakable. It all starts at the grass root level: business executives and business owners curtail unprofitable investments and seek more short-term funding to finance expanding working capital needs. So the Shape of the Yield Curve reflects a changing time frame of most critical funding needs for businesses during economic cycles. See Figure 2: it shows that the Slope of a Yield Curve is a nice leading indicator of a recession. In that particular case, we use a simple difference between a 10 Year and 1 Year Yield of Treasuries. Then, why do Central Bankers are inferior at making economic forecasts: because they don’t listen to the market and try to predict the economy. If Central Bankers do idealistically try to mitigate the economic cycle (and if you believe their romantic goals of managing inflation and full employment) why do cycle still exist? The point why Yield Curves are so much better than at predicting recessions is simply because Yield Curves is the Market while Central Bankers just one of the contributing forces to the market. Do you have an alternative explanation of why the shape of a Yield Curve has such a good predictive power? ← Is Gold acting as a Leading Indicator for Rates?